Heavy smoke was observed leading to the sealing of compartment 3 of the submarine. A similar incident occurred on board INS Sindhurakshak where 18 people were killed. Months after a fire on the INS Sindhurakshak killed 18 personnel, two officers were feared dead and seven other Navy personnel seriously injured in a mishap involving the Russian-origin Kilo Class submarine INS Sindhuratna off the coast of Mumbai on Wednesday. The two officers, a Lieutenant and a Lieutenant Commander, were initially declared missing. Close to 80 sailors were on board the Sindhuratna when the incident took place early on Wedenesday. The Navy said there was no explosion on board the Sindhuratna but heavy smoke was observed leading to the sealing of compartment 3. Initially, an explosion in the battery compartment of the submarine was suspected to be the reason behind the accident. The Navy said all seven sailors who had been evacuated after smoke inhalation on Sindhuratna are out of danger but two officers are still missing. The two officers missing (and feared dead) were inside compartment 3 of Sindhuratna that was sealed shut after heavy smoke detected. Currently, the compartment 3 is being force ventilated while the search is on at cabins within the compartment for the missing officers. The Sindhuratna had no weapons on board and it was undergoing sea inspection after a six-month refit in Mumbai. This is the tenth accident involving an Indian Navy warship and the third submarine mishap in the last seven months. 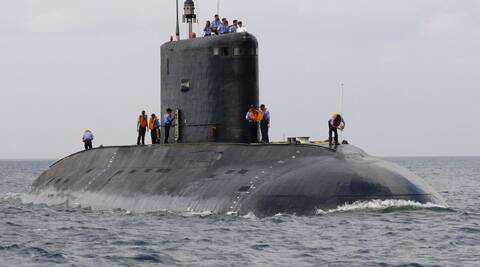 INS Sindhuratna was involved in an exercise along the Mumbai harbour when a leakage in the battery compartment of the submarine occurred resulting in five Naval personnel suffering suffocation, Navy sources said. The Navy personnel fell unconscious and had to be airlifted to the naval hospital INS Ashwini in Mumbai, they said. The sources said a Board of Inquiry under a senior officer has been ordered to ascertain the reason behind the mishap. A Navy spokesperson refused to comment on the issue. It is learnt that a senior naval officer of the submarine wing was present on Sindhuratna when the incident took place. Around a month ago, INS Sindhughosh had a close shave when it entered the Mumbai harbour during a low-tide phase and was about to run aground. INS Sindhurakshak sank in the Mumbai harbour last year, killing all 18 personnel on board. Defence Minister AK Antony has sought a detailed report from the Navy on the issue. Earlier this month, INS Airavat, an amphibious warfare vessel, ran aground after which the commanding officer was stripped of his command duties.After the sinking of the INS Sindhurakshak, one of the mishaps involved INS Betwa which was damaged after probably hitting some underwater object. India’s leading minesweeper, the INS Konkan that was undergoing repairs in Vizag, caught fire and suffered major damage to its interiors. The Pondicherry-class minesweeper was getting a refit at a dry dock when the incident occurred. The naval headquarters is concerned over the spate of mishaps in the Western Command and had even summoned Western Naval Commander Vice Admiral Shekhar Sinha on the issue.